Home Infusion Therapy Market size was over USD 14 Billion in 2016, with an expected forecast of over 9% CAGR from 2017 to 2024. 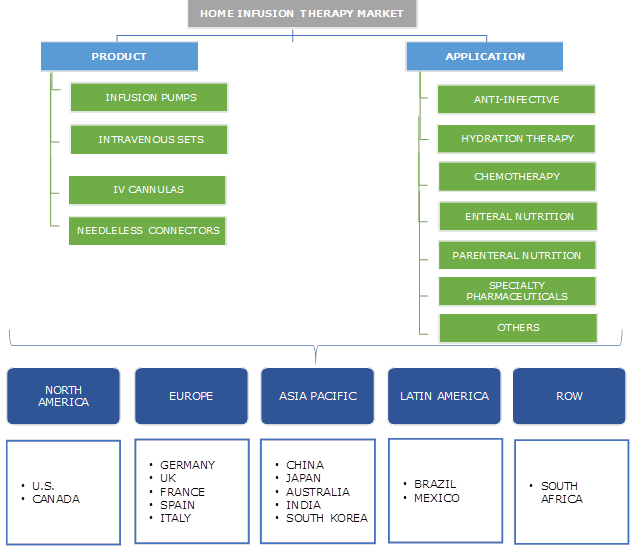 Home infusion therapy market is expected to witness significant growth due to rising incidence of chronic diseases, such as diabetes, cancer, cardiovascular and respiratory diseases. Growing geriatric population who are prone to such diseases will further drive industry growth. As per WHO, chronic diseases accounted for over 60% of deaths in 2015, and expected to reach 73% by 2020. Increasing adoption of home based infusion therapies due to growing prevalence of hospital acquired infections and various other diseases caused by bacteria, virus, and fungal pathogens should increase demand for home infusion therapy. Technological advancements in infusion pump such as smart pumps should propel industry growth. Risk associated with the dose administration, irregular functioning of infusion devices, inappropriate usage of these devices and dearth of reimbursement in under developed countries should restrain business growth. Needleless connectors should grow at a significant rate from 2017 to 2024. The rapid growth is attributed to increased adoption by patients and medical fraternity. Needleless connectors aid IV therapy delivery system and assure safety for healthcare specialist from needlestick injuries. Infusion pumps generate major revenue share in the market. Increasing use in medical settings such as, hospitals, homecare, and nursing homes should drive business growth. Technological advances with enhanced safety characteristics like barcode technology, alarms and other operator alerts should propel industry growth over the forecast timeframe. Anti-Infectives are projected to contribute significant revenue share in 2016. Increased demand for anti-infective therapy for treatment of infectious diseases should drive segment growth. Benefits associated with administration of anti-infectives includes, well-being of patient at home, decreased problems of intravenous (IV) cannula, reduced risk of nosocomial infections and increased patient satisfaction. Enteral nutrition should witness lucrative revenue growth opportunities over the forecast period. Enteral nutrition (EN) provide nutrition for patients with disorder of stomach, esophagus, and pharynx that stops nutrients from reaching to captivating surfaces in small intestines. Healthcare providers such as certified nutrition dietitian, registered dietitians (RD) as well as enteral supply coordinators offer better enteral nutrition management support. U.S. market accounted for substantial revenue share in 2016 due to growing incidence of chronic diseases and increased adoption of home healthcare facilities. Moreover, favourable reimbursement policies and improved access to healthcare should drive industry growth. Germany market should contribute for robust growth owing to the increasing geriatric population base and growing chronic disease prevalence. Technological advancement in infusion devices and its growing application in pain management should drive the global market growth. Japan market should witness robust growth owing to growing use of home based infusion therapy to improve health. Moreover, increasing incidence of chronic diseases, infrastructure developments, and advancement in technology and product innovation in IV therapy should drive industry growth. Companies operating in home infusion therapy includes Baxter, CareFusion, Smiths Medical, Fresenius Kabi, Caesarea Medical Electronics, B. Braun Melsungen, ICU Medical, Terumo and JMS. The industry participants adopted several strategies such as product development, technological innovation and merger and acquisition to expand their market position and product portfolio. For instance, in January 2016, Fresenius Kabi acquired the U.S. BD Rx business from Becton Dickinson to expand its portfolio of ready-to-administer prefilled syringes. 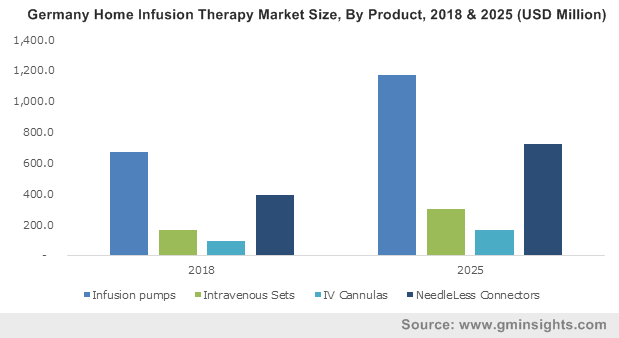 Home infusion therapy market is driven by increased technologically improved products, favorable regulations, and developments in health care. For instance, Medicare Home Infusion Site of Care Act in 2015, ensure that beneficiaries for Medicare should receive infusion treatment at home. Infused drugs and those administered intramuscularly and intravenously are paid under Medicare Part B. Technological advents and developments should drive industry growth. Industry is extremely competitive. Industry players are engaged in continuous R&D for new products and identify better and improved technological solutions.